Winter storms? Thunder storms? We've got you covered! 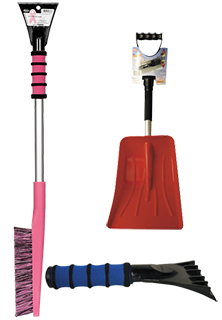 We have a variety of sizes when it comes to your snow brush needs! We also carry shovels to help clean those driveways for your tires to have an easier time with the morning commute. We carry all the rage umbrellas, Inverted, in solids and patterns! Get your display today! We have the lowest prices in the nation. GUARANTEED!